Chianti is a region in central Tuscany where the iconic Chianti and Chianti Classico wines are produced. It is one of the best places for oenophiles to visit and learn about Italy's wine culture. But keep in mind that wine tasting in Italy is a little different than in the United States because you'll need to make reservations for tastings in advance and things move much slower in Italy, so you're likely to only see one or two vineyards a day. First, pick a region or wine producer in Chianti that you particularly like. The Chianti region of Tuscany has seven distinct areas, each of which produces a specific kind of Chianti wine. 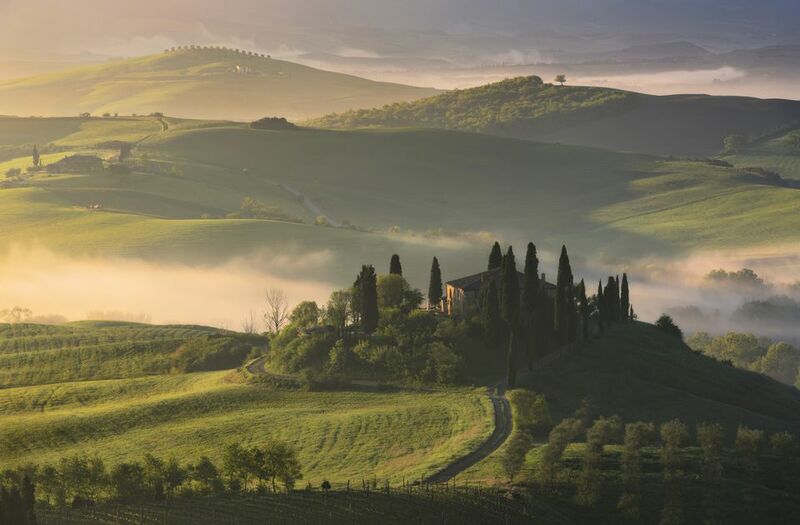 The wines of the Chianti Classico region between Florence and Siena are the most well-known options in the area. Chianti Classico wine has been produced for more than 2,000 years, but the region really became famous for its vino from the 13th century to today. A few of the popular wine towns to choose from include Greve in Chianti, Castellina in Chianti, Gaiole in Chianti, Radda in Chianti, Barberino Val d'Elsa, San Casciano in Val di Pesa, and Castelnuovo Berardenga. When you've found some wineries you think you would like, the next step is to contact them and make an appointment to do a tour or tasting. Some even offer small bites, wine and cheese, or a full meal. Only the larger wineries have the capacity to deal with walk-up tours and tastings; others are small family-owned wineries that require reservations. Don't choose more than two or three wineries. Things are slower in Italy than in Napa Valley, so it's better to enjoy it than rush around. Keep in mind that too many tours can also get repetitive. There are only a few variations on the fermenting theme. Some of the favorite wineries to visit and tour include Barone Ricasoli Brolio Castle, Casa Emma, and Castello di Verrazzano. You can also find wines to taste, drink, or buy, at an enoteca (a local wine shop in Italy). One of the largest in the Chianti Classico area is Le Cantine di Greve in Chianti, where you can do a tasting of wine, cheese, salami, grappa (grape-based brandy), and olive oil. Just make sure to pace yourself; there's also a wine museum and more than 140 vinos to try. Almost every small village in Italy has an enoteca, so if you'd like to stop by more of them, they're not hard to find. If you'd prefer to visit wineries without having to worry about drinking and driving, Viator offers both full-day and half-day escorted tours that include visits to villages and Chianti wineries with wine tastings. There is a lot to see and do, and plenty of good restaurants. Where there's good wine, it never fails that there's also good food. The Chianti region is flush with high-end hotels, farmhouses, and bed and breakfast accommodations. Want to sleep in a castle? Try Hotel Castello di Spaltenna in Gaiole. This four-star stay is housed inside a historic villa that overlooks the lush countryside and vineyards. What Are the Best Places to Go in Tuscany?